Madeleine L’Engle’s A Wrinkle in Time has captured the imagination of millions—from literary sensation to timeless classic and now a major motion picture starring Oprah Winfrey, Reese Witherspoon, Storm Reid, and Mindy Kaling. A Light So Lovely tells the story of the woman at the center of it all—her imagination, her faith, her pattern of defying categories, and what readers today can learn from her legacy. Bestselling and beloved author Madeleine L’Engle, Newbery winner for A Wrinkle in Time, was known the world round for her imaginative spirit and stories. She was also known to spark controversy—too Christian for some, too unorthodox for others. Somewhere in the middle was a complex woman whose embrace of paradox has much to say to a new generation of readers today. A Light So Lovely paints a vivid portrait of this enigmatic icon’s spiritual legacy, starting with her inner world and expanding into fresh reflections on her writing for readers today. Listen in on intimate interviews with L’Engle’s literary contemporaries such as Philip Yancey and Luci Shaw, L’Engle’s granddaughter Charlotte Jones Voiklis, and influential fans such as Makoto Fujimura, Nikki Grimes, and Sarah Bessey, as they reveal new layers to the woman behind the stories we know and love. A vibrant, imaginative read, this book pulls back the curtain to illuminate L’Engle’s creative journey, her persevering faith, and the inspiring, often unexpected ways these two forces converged. For anyone earnestly searching the space between sacred and secular, miracle and science, faith and art, come and find a kindred spirit and trusted guide in Madeleine—the Mrs Whatsit to our Meg Murry—as she sparks our imagination anew. Available in paperback, eBook, and audio formats. author, Vanishing Grace: What Ever Happened to the Good News? "Madeleine was a true bridge builder; and if ever we’ve needed some, now is the time." 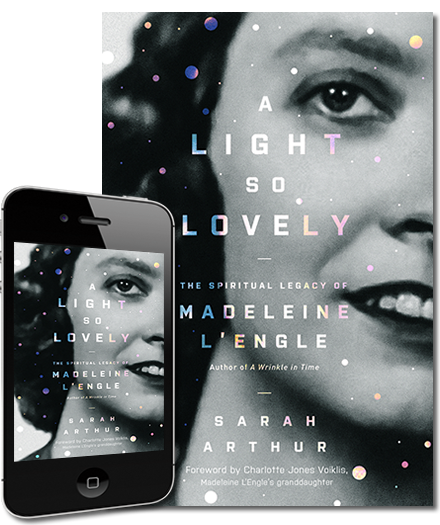 "I’ve waited a long time for a book about Madeleine L’Engle’s spiritual legacy and A Light So Lovely was entirely worth the wait." "This book has a secret. It’s a magic word—one so small you might overlook it. The word? And. It’s everywhere in this book, marking how Madeleine L’Engle reconciled what we have divided. Like L’Engle’s vision, Arthur’s book is for believers and unbelievers. Readers and writers. Fans of science fiction and romance. People of faith and people of science—and those who love both of those languages." 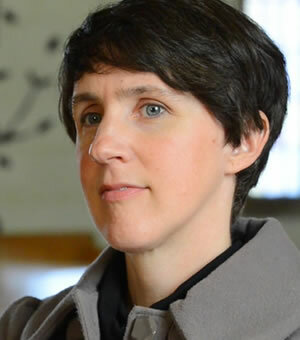 Sarah Arthur is the author of over twelve books ranging from bestselling devotionals to critical engagement with literature. A graduate of Wheaton College and Duke University Divinity School, she's a founding board member of the annual C.S. Lewis Festival and served as writer-in-residence for the Frederick Buechner Writers Workshop at Princeton Theological Seminary. She's also the preliminary fiction judge for the Christianity Today Book Awards, through which she grades on a L’Engle-inspired curve. She can't wait till her two little boys are old enough to be read aloud A Wrinkle in Time.